Showing 1 - 1 of 1 Products for Engine Ignition RPM Governor. If your Coyote powered Ford was built after February 23, 2016, and you need a 2-Step rev-limiter for consistent burnouts or launches, MSD part number 87311 has you covered. 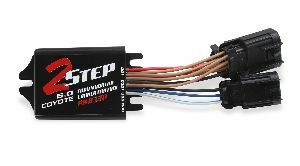 When activated, the 2-Step will hold your engine at a constant RPM. This can be achieved by way of a clutch switch or push button. As soon as your activation switch or button is released, full ignition is restored and you're off to the races. The rpm is adjusted with two built-in rotary dials ranging from 1,800-9,900 rpm in 100 rpm increments. A handy LED shows when the launch rev limit is active.